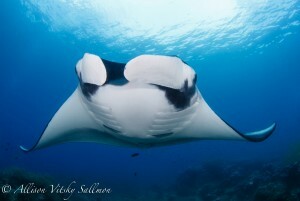 Fak-Fak MPA and Conservation Programs begin! Six Months in Fakfak: What Have We Been Doing? After Raja Ampat and Kaimana, CI Indonesia is now expanding its conservation work in Bird’s Head Seascape in Fakfak Regency, West Papua. Fakfak is also a region with a high potential for fisheries, such as grouper, snapper, pelagic fish, mud crabcrabs, and flying fish eggs. 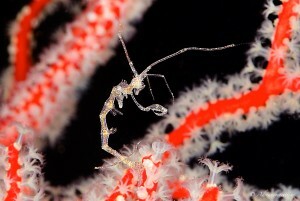 Additionally, Fakfak also has rich marine biodiversity. 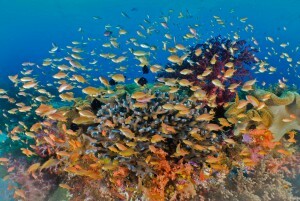 It is home to more than a thousand species of coral reef fish species and more than 450 coral reef species. 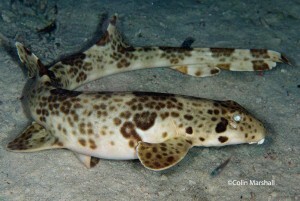 However, this potential is threatened by illegal, unreported, and unregulated (IUU) fishing. 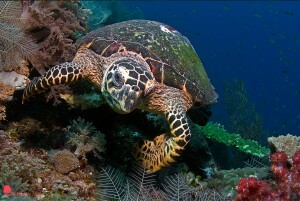 To address these issues, as an implementing partner of The USAID Sustainable Ecosystems Advanced (USAID SEA) Project, we aim to support the development of 350.000 ha of MPAs in Fakfak and improve its management to reach “green” level according to Effectiveness of Conservation Area Management and Ecosystem Based Fisheries Management (EKKP3K). 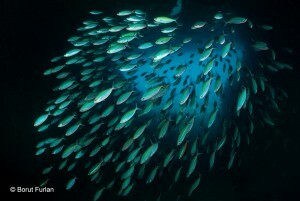 Green level refers to a minimum MPA management which covers the establishment of management and zoning plan, MPA Management unit and management’s Standard Operating Procedures (SOP). CI’s works in Fakfak with the support of the USAID SEA Project started in November 2017. Since then, a range of activities have been conducted in close collaboration with the local government. The project followed up CI’s facilitation for Fakfak Government initiative to build MPAs in their region. 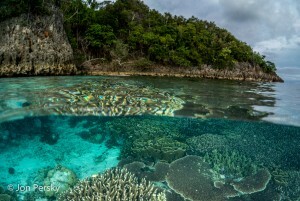 Considering results from CI’s research recommendations, a series of community meetings, socialization, and adat declarations as a form of community support on MPA initiatives, the Governor has issued West Papua Governor Decision No: 523/2017 on the Fakfak MPA designation to reserve 350,000 ha of MPAs. A photo-op after an Adat Declaration of Nusalasi Van den Bosch Bay and Berau Bay MPA, 20-22 November 2016. We invite the communities to participate in our activities because their lives depend directly from nature. 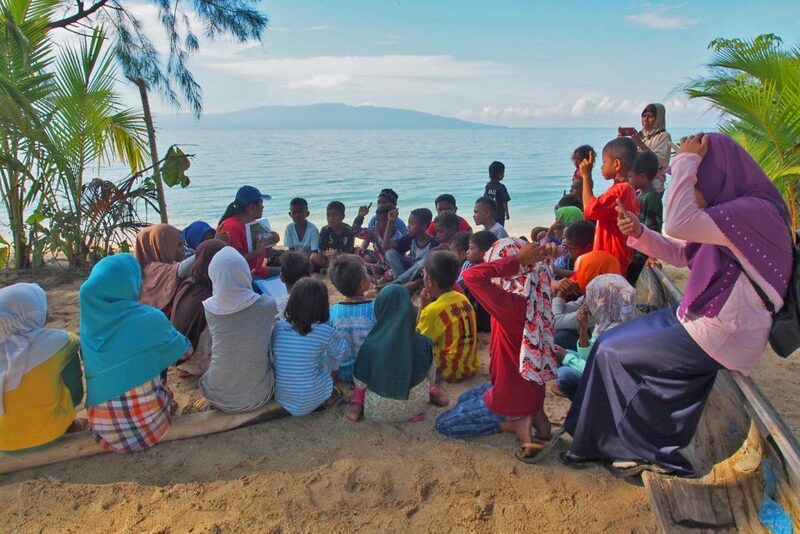 We kickstarted the project by introducing Marine Protected Areas (MPA) and conservation approaches through various community awareness campaign event. A total of 550 Fakfak residents attended this series of events and expressed their concern about the threats faced by their ocean and enthusiasm to protect it. Fakfak leaders and residents have also accepted and supported the MPA establishment in their areas. Education could be conducted not only indoors, but also outdoors. In our Environmental Education activity, elementary school students were taught to understand the importance of nature. Each student was asked to mention their names, classes, and favourite sea creatures. Head of Marine Space Management, West Papua Office of Marine and Fisheries (DKP), Bastian Wanma, noted the importance of MPA awareness raising activity.“The government needs a partner, or CI as an implementing partner of USAID-SEA to coordinate, cooperate, and complement each other. 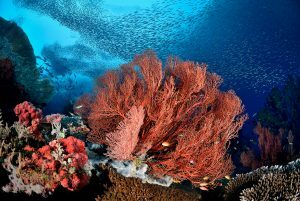 As a government’s partner, we hope that USAID-SEA will be able to give significant contribution to this project supported by CI’s years of experience in conserving Raja Ampat,” he said. Not only local community, government is also an important part to support the MPA in Fakfak, since they’re the one who will run the management body and undertake law enforcement. To address this, we have provided technical assistance to the Fakfak Regency and West Papua Provincial Governments for the legal gazettementof the Fakfak MPAs. Through this activity, we helped improve the government’s knowledge and build the capacity of local fisheries services. In early 2018, as a part of MPA establishment process, we engaged closely with the community. 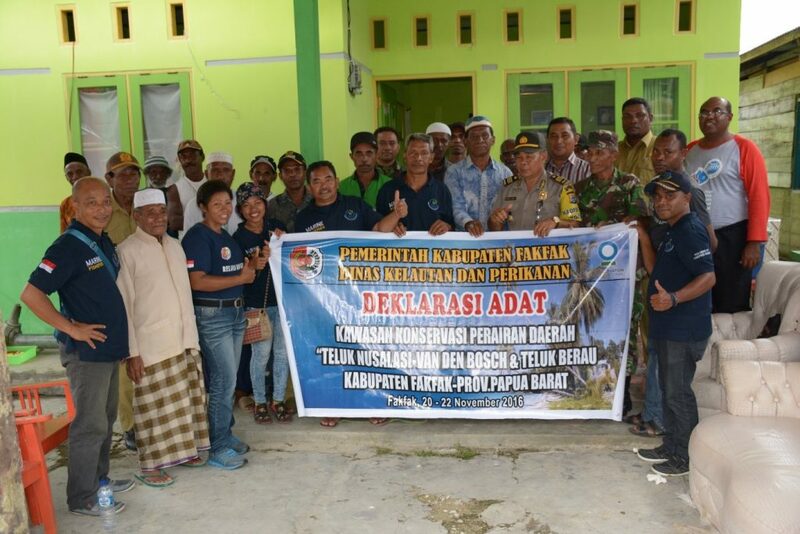 A Sustainable Fisheries Training was held and attended by 51 people consisting of 39 Fakfak government officials and 12 fishers. From the pre- and post-tests conducted to measure participants’ knowledge improvement, we found an increase of the average score which indicates the overall improvement of participants’ understanding. We used teaching aid to make the training session more interactive. Each participant was given a picture of marine organism and ropes to represent the interaction between them. From this simulation, participants could comprehend the complexity of marine food web and how losing one or more organisms could affect the overall community. 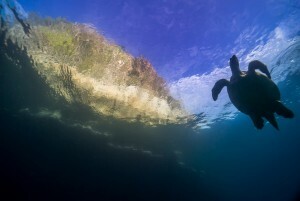 Other community engagement activities were community meetings and consultations where the community themselves proposed 60,000 ha of no-take zones to be included in the MPA. Approximately 250 villagers attended the community meetings and consultation process, showing their commitment and support to create non-fishing areas within their traditional fishing grounds. Lastly is the expert workshop that managed to produce 12 thematic maps, including 4 no-take zone maps. These maps are useful in the MPA establishment process. Post-activity photo-op with Antalisa residents and representatives of the West Papua Fisheries and Marine Affairs Unit. Antalisa Village is one of several villages visited for the socialization activities where the residents are enthusiastic about the idea of developing MPAs that will benefit them in the long run. 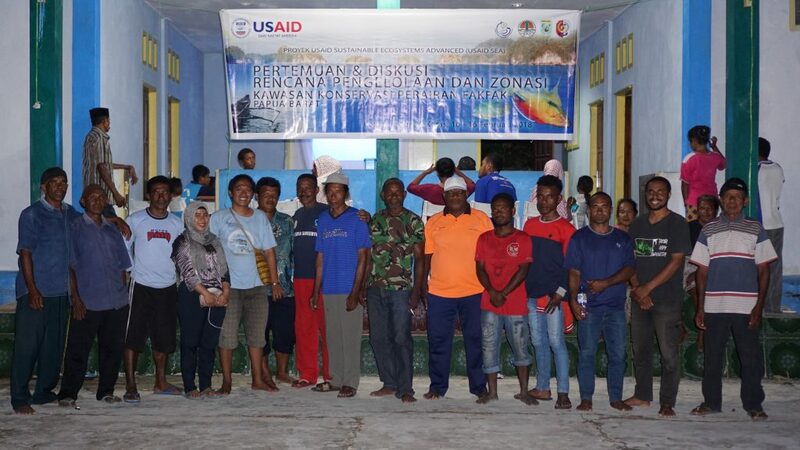 To recap, in six months, USAID-SEA Project in Fakfak has produced one government policy on MPA initiation, two community declarations to protect the environment, and IDR 160 million as the amount of public investment by the Fakfak government in conservation program. Nonetheless, there are still a lot of homeworks to be done until the end of the project in September 2019. To complement those activities, a biophysics and socio-economic survey has been carried out recently, updating the previous results of the 2006 survey. We have found at least nine potentially new species in Fakfak in this survey, along with many potential tourist objects. Community meetings, public consultations, and workshops will also be an integral part of the program to ensure sustainable use of marine resources by local community.